March Madness. More than a series of games played in March. The madness of exuberant joy paired with unforeseen hope. Heart-wrenching, breath-stopping, out-of-nowhere Cinderellas. At some point a bracket buster takes center stage. It’s part of the madness. 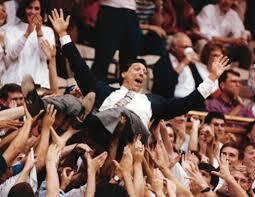 Who could have predicted, for example, a young Jimmy Valvano running in ecstatic circles on the court after his NC State Wolfpack won it all? You just never know what passion and determination could lead a team of players to accomplish. It’s insanity. It’s madness. It’s the Road to the Final Four that culminates, this year, in Phoenix. We are in the season of the Christian calendar year that gives us game-by-game descriptions of Jesus’ March of Madness. The Cinderella Savior. Born out of wedlock, into a very common family. Outcast and despised by many, including his own family. Isaiah 53 rather bluntly describes Jesus as one most didn’t think would make it past the first round. Paraphrase: No one’s bracket had Jesus winning it all. He chose the Way of Suffering. A road called the Via Dolorosa. Not the Road to the Final Four; it was the Road to His Final Hour. A resolute march to the cross, compelled by a mad-crazy love. The March of Madness. You will never understand it if you analyze it as a competitive sport of wins and losses. The only way his march makes sense: Read it as a love story. His love is both beautiful and maddening because, well, true love doesn’t make logical sense. This love, this Jesus Love, this mad-crazy march of love is not dependent on what it gets in return. Let’s replay that sentence like it’s a game-winning shot (because it is) — Jesus’ mad-crazy love is not dependent on what it gets in return. Journey with Jesus on his Road to his Final Hour, his obedient march to his cross death. Start in John 11 and read it through. But savor it, digest it slowly, like a 3-week tournament culminating on Good Friday and Easter. Meditate on his march out of comfort and into broken. Sit in silence to help you hear the cheering and jeering. Victories disguised in defeat. Tears that sing joy. Passion. Determination. It is accomplished. The Road that culminated on Skull Hill. Read it for the love story it is, the march of mad-crazy love. Accept that love, and all of heaven will rush the court to embrace you.